3/27/08 - MpgGenie was referenced on Lime.com. The blog was about comparing hybrid vehicles to traditional cars. Just because a vehicle says its a "hybrid", that doesn't mean it is fuel efficient! MpgGenie on Lime.com. 3/21/08 - MpgGenie was referenced on the Los Angeles Times Blog. The blog was about the high cost of commuting to work in LA. MpgGenie on LA Times Blog. 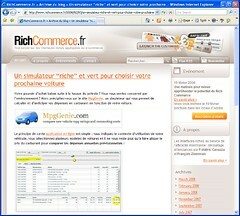 3/18/08 - MpgGenie is featured on RichCommerc.fr. 3/6/08 - MpgGenie was referenced on riverwired.com. The blog compares a SUV to a compact car and the commuting cost difference between the two vehicles. 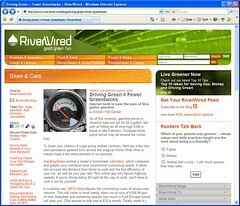 MpgGenie on riverwired.com. 2/11/08 - MpgGenie is featured on GoodCleanTech.com. 2/10/08 - Thanks to John and Xavier for getting MpgGenie.com on AutoblogGreen! AutoblogGreen is a very active blog that concentrates on environmental friendly vehichles and transportation. For the latest news on environmental friendly green vehicles, check out AutoblogGreen.com. 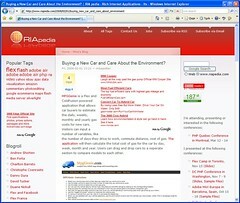 2/1/08 - MpgGenie.com is featured and reviewed on RIApedia. RIApedia is the premiere listing for the latest and greatest in Rich Internet Applications (RIA) built with Adobe Flash, Adobe Flex and Adobe Air. 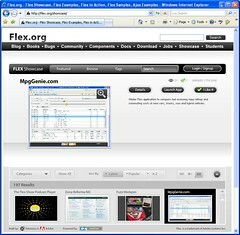 1/17/08 - MpgGenie.com is featured on Flex.org. The showcase on flex.org features the latest and coolest applications being built with Adobe Flash, Adobe Flex and Adobe Air. If you want to see where web applications are going in the future, check out the showcase on flex.org!